My first encounter with the German brand Stilform -a couple months ago when I reviewed the Stilform Ink (read my review HERE)- was a very positive one. And it got me really excited to try out the ballpoint pen version of Kosmos as well! The names of both the fountain pen and ballpoint pen are quite similar, which makes sense because both the Kosmos and Kosmos Ink are based on the same concept: to build a pen around a magnetic mechanism! The design language of both Kosmos products is also quite similar. Both are characterized by a minimal design, rounded finials and cleanly chamfered edges... The result is a simple but very well-executed design. Contrary to the Ink, it lacks the flat sides that prevents it from rolling, which I actually think could've been helpful because it rolls around like crazy (needless to say this one saw some abuse, and visited the floor a couple times). Stilform does offer a walnut pen rest, but you have to buy it separately and it's not particularly travel-friendly. The Kosmos comes in two metal options: aluminium or titanium. I received the Kosmos Ti to review, which has a bit more heft than the aluminium option, and it comes in two finishes: polished or matte. The polished version I received is sleek and shiny, and has a very space-age feel to it. Being mirror-polished, it does pick up scratches and scuffs quite easily. After a few months of playing around with it, it's quite battle-worn, so if you don't like that, the matte version is supposedly more resistant to scratches. The two titanium parts (front section and barrel) are spaced with a black metal inner sleeve, which is part of the mechanism. 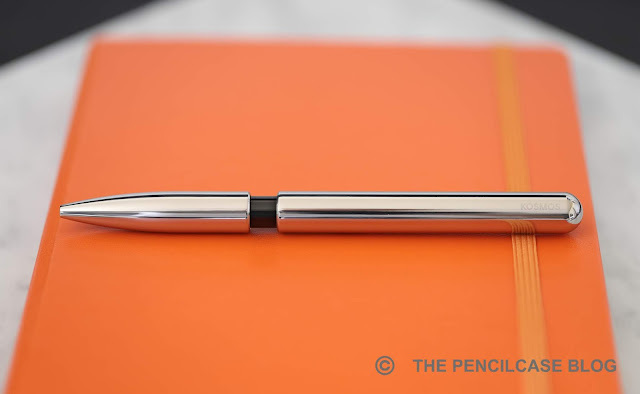 When the pen is opened, it retracts, and the chamfered edges of the two titanium halves meet neatly. The Kosmos is a nicely sized pen. 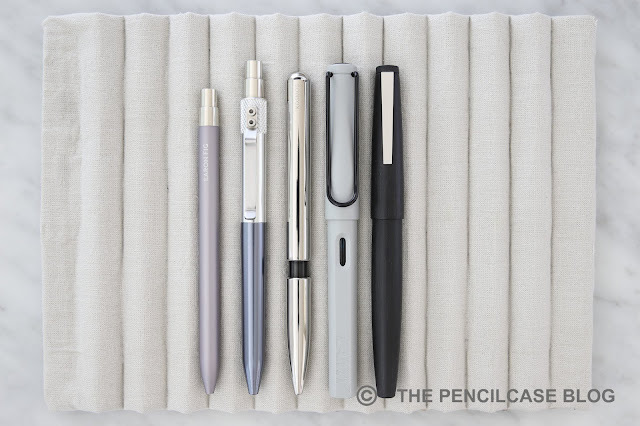 It feels small in comparison to other ballpoint pens, but in reality it is far from small. Measuring 13.7 cm (5.4") 'closed' and 13.4 cm (5.27") 'open', it's a decently sized pen in the hand. 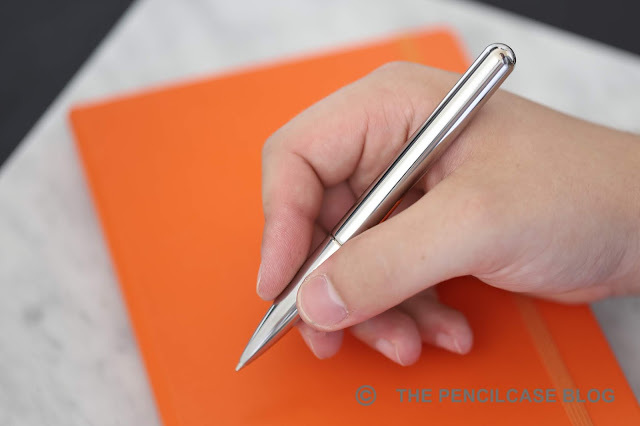 The profile is fairly slim, with a constant diameter of 11 mm across the entire barrel, the front section narrowing down towards the tip of the pen. 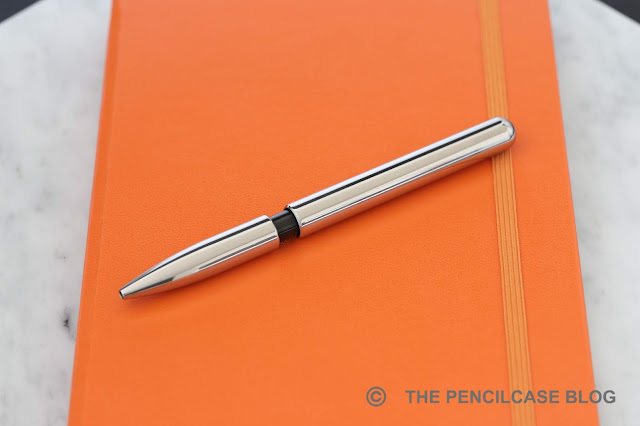 The slick finish of this particular polished titanium finish in combination with the streamlined profile makes this pen somewhat slippery to hold at times, which I think may be better with the matte aluminium or sandblasted titanium options. The Kosmos Ti feels solid in the hand, at 42g. I personally like heavier pens, but if you don't, the aluminium version is a good bit lighter at 26g. The way this pen works is really cool. They have a diagram on their Kickstarter page (unfortunately I couldn't find it on their website) that shows the guts of the Kosmos, and it's actually surprisingly simple: a magnet connected to the front section and the black 'inner tube' is pushed and pulled by magnets on either side that are fixed to the barrel. When operating the mechanism, the magnets pull on the moving magnet and keep the barrel in either extended (closed) or retracted (open) position. When it works, it works really well. 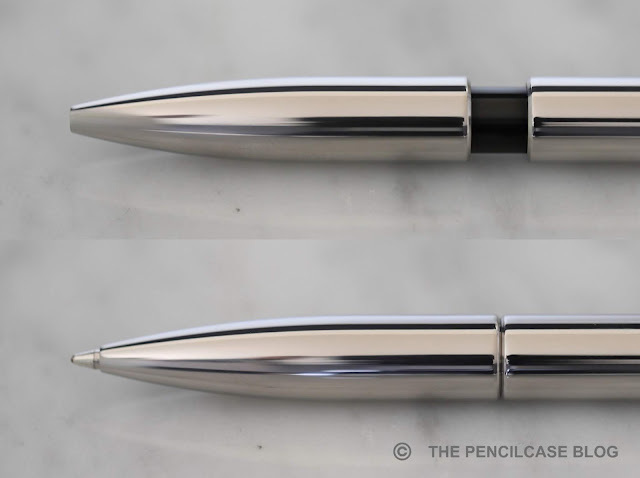 The magnets are really strong and you need a tight grip to open and close the pen. The action works with a very satisfying (and very loud) snap. But unfortunately... it doesn't always work. I tested one of the pre-production prototypes of the Stilform Ti about a year ago, and the mechanism failed after a couple days so I never got around to actually reviewing it. Luckily they seem to have fixed the issue in the production model that I have in my hands right now, which has clicked satisfyingly for months and still works just fine. 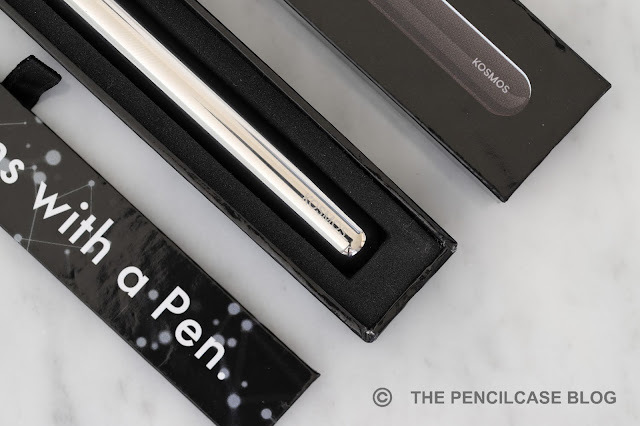 Writing with the Kosmos pen is smooth and hassle-free. I have a strong suspicion that they utilize Schmidt easyflow 9000 Parker-style refills, but it's just branded 'Kosmos' so I'm not entirely sure. In any case, it's an extremely pleasant refill, and it actually made me want to use this pen all the time. It's dark and smooth, lays down a consistent medium line. The Kosmos Ti is an interesting piece of functional design. 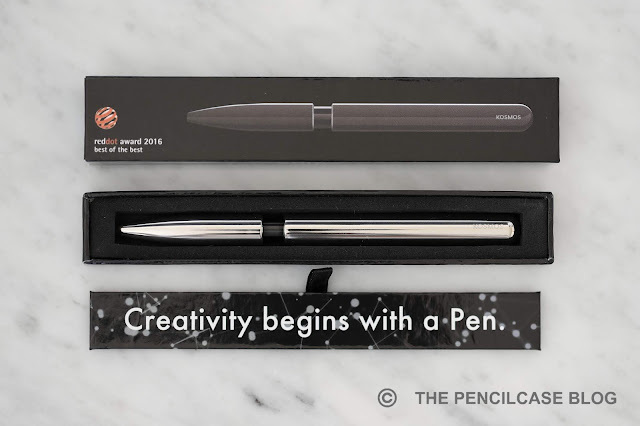 It's a pure, minimal pen, built around a really interesting and unique mechanism. It ticks a lot of the right boxes for me. The polished titanium finish is perhaps a bit too slick for my liking, but the excellent refill (and compatibility with a bunch of other refills) pulls the whole experience up a notch. The Stilform Kosmos Ti comes in at a retail price of 120€ (136$), which is exactly double the price of the aluminium Kosmos. I'm usually a big fan of titanium pens, they are strong, have a nice heft and look good while at it. But in this case, while I think the aluminium Kosmos is a pretty good deal for what you get, the premium for the titanium version might be a bit steep. This product was sent to me by Stilform, so I could write this review. I was in no way influenced in the making of this review, the opinions shared in this review are completely my own! This post does not contain affiliate links.